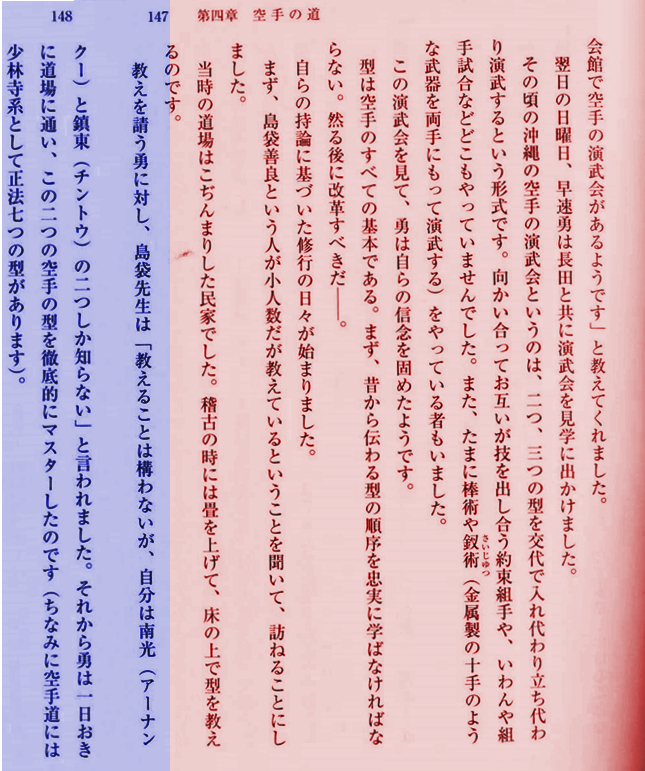 Previously I wrote a short article about Shimabukuro Zenryō. There I described the so-to-say official version of his bio. This official version states, that he learned the seven main karate kata of Kyan Chōtoku: Sēsan, Anankū, Wanshū, Passai, Ūsēshī, Chintō, and Kūsankū, as well as Tokumine-no-Kon. I also variously mentioned Tamotsu Isamu and his huge-yet-often-overlooked influence on post-war Okinawa Karate. Now I stumbled across a Japanese book with a precious eyewitness account, if you will. It is about the Kata that Shimabukuro Zenryō actually knew. First, as regards Tamotsu Isamu (1919-2000), I think he is well-known. Hailed from Amami Ōshima in Kagoshima prefecture, he graduated from the“ Prison Police Officer Training School of Taiwan”. In the postwar era, it was Tamotsu Isamu who influenced Nakamura Shigeru, Nakazato Jōen and Shimabukuro Zenryō to participate in Japanese Karate, specifically, kumite matches with full-contact gear. And, no doubt, it was from Tamotsu the Okinawans got their full-contact gear from. In 1955 Tamotsu established the Shōrinji-ryū Renshinkan. Apparently he was the first person who used the name Shōrinji-ryū. It seems that both Nakazato Jōen and Shimabukuro Zenryō followed suit (it seems Zenryō later changed it to Shōrin-ryū for some reason). Tamotsu also brought Shimabukuro Zenryō into the original JKF (usually referred to as FAJKO). And this was the reason that formed the Okinawa branch of the original JKF under the name of “JKF– Okinawa District Special Headquarters”, of which he assumed presidency. Nakamura Shigeru (Okinawa Kenpō) was among the board members. And Tamotsu studied both with Nakazato Jōen and Shimabukuro Zenryō. The above was just a reminder about the person we are talking here. Well, I am getting to the point now. The contemporary witness I mentioned earlier is none less than Tamotsu Sachie (1923 – 2016), the wife of above describe Tamotsu Isamu. In 2002 she published a book about her late husband. Therein she also covered her late husband’s years with the Okinawans. Since Karate people can be quite finical, a question arose: When exactly was that? Well, during this visit, Tamotsu Isamu stayed on Okinawa from February 1954 until spring 1955, when he returned to Kagoshima. This is described in the book, too (page 149). In between the training classes, he [Tamotsu Isamu] also practiced jūdō for American soldiers. During his stay in Okinawa, [Tamotsu] Isamu devoted himself to cultivating the study and physical strength of Karate. Soon, students of the Futenma dōjō and also even senior students of Shimabukuro [Zenryō’s] dōjō heard the rumor that [Tamotsu] Isamu created his own techniques based on basic movements, and began to visit [Tamotsu] Isamu to learn Karate. Well, I leave it up to you what you make of this. Tamotsu Sachie: Toshu Kūken: Ningen Tamotsu Isamu (Unarmed – The Man Tamotsu Isamu). Bungeisha, 2002. pp. 147–148. This entry was posted in Unknown Ryukyu and tagged Nakazato Joen, Shimabukuro Zenryo, Shorinji-ryu, Tamotsu Isamu, Tamotsu Sachie. Bookmark the permalink.